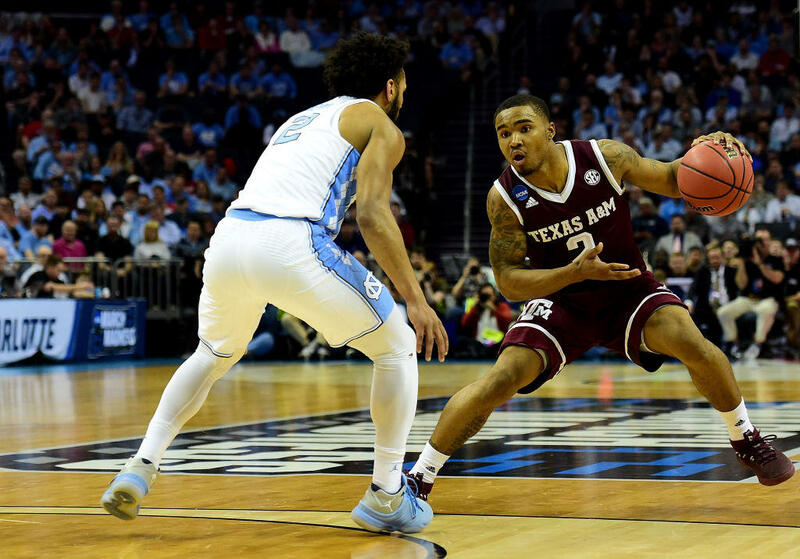 CHARLOTTE, N.C. -- T.J. Starks scored 21 points and Texas A&M overpowered North Carolina inside, upsetting the reigning national champions 86-65 Sunday in the NCAA Tournament to mark the second straight year a title holder missed the Sweet 16. The seventh-seeded Aggies (22-12) did everything they had to do to hand the Tar Heels a rare loss in a home-state NCAA game. They dominated the glass. They used their size to control the paint and block shots. And they pounced when UNC's small-ball lineup couldn't make an outside shot. CBS Sports analyst and former Ohio State forward Clark Kellogg was one of the experts predicting greatness from the Aggies come March. "I think Texas A&M would be a team that could be very dangerous," Kellogg said ahead of the tournament. On Sunday, Robert Williams finished with 13 rebounds, helping the Aggies take a 50-36 edge while shooting 52 percent -- including 10 of 24 from 3-point range. Joel Berry II scored 21 points in his final game for the second-seeded Tar Heels (26-11), who were trying to reach their third straight Final Four. But they ended up falling to 34-2 in NCAA games in their home state, the only other loss coming in 1979. The Tar Heels shot just 33 percent, including 6 of 31 (.194) on 3-pointers after entering the game shooting nearly 37 percent from behind the arc. It came on the same court where, two nights earlier, UMBC made history by becoming the first 16-seed to beat a 1 when the Retrievers upset top overall seed Virginia. And as with that game, the upstart dispatched the favorite with surprising ease. And, yet again, the reigning champs lost in the second round. Last year, Villanova was bounced by Wisconsin. Meanwhile, the Aggies -- who peaked at No. 5 in the AP Top 25 in December -- is moving on to the Sweet 16 for the second time in three seasons. The Tar Heels were a very different team than last year's title winner, namely in the way they leaned on a small-ball lineup. But expectations grew that they could make a third straight Final Four run as UNC found a final-month groove, including two wins against Duke and a trip to the Atlantic Coast Conference Tournament championship game. Instead -- after a heartbreaking title-game loss to Villanova in 2016 followed by last year's title win against Gonzaga -- the Tar Heels found themselves eliminated on the tournament's opening weekend for the first time since 2014. The Tar Heels led 20-13 early only to see the Aggies go on 15-0 run to change the entire dynamic of the game. Tyler Davis (18 points, nine rebounds) got loose for three baskets inside as the Aggies asserted themselves in the paint, while UNC started missing shot after shot. By halftime, the Aggies had pushed to a 42-28 lead, then got 3-pointers from Admon Gilder and D.J. Hogg to open the second half and push the margin to a stunning 20 points. Amazingly enough, the Tar Heels got no closer than 17 again to stun a crowd that was wearing a lot of blue and expecting the Tar Heels to advance. UNC had won 12 of 13 NCAA Tournament games dating to its 2016 finals run before Sunday.